Developed by RAND in the 1950s, the “deliberative tool” called the Delphi method is a forecasting technique, in which a panel of selected experts responds anonymously, in writing, to two or more rounds of carefully designed questionnaires. Following each round, panellists' input is aggregated by moderators (or facilitators) and then shared with the whole group. The experts, who usually include actors and stakeholders, and who may be geographically near to, or distant from each other, consider the views of the other panellists and are free to maintain, change, expand, or fine-tune their answers in successive rounds. Through this iterative process of co-construction, the panel endeavours to reach a common position, facilitating the creation of innovative solutions to complex problems. The rapturous marketing hype, for open source and commercially available e-Delphi software, commonly promises unanimity, with glib slogans like “better solutions through collective intelligence” and “a proven way to harness wisdom”, but as Cole, Donohoe, and Stellefson (2013) caution researchers, survey iteration can end in disagreement and no consensus. Through dedication and persistence, CATALISE, the 2016-2017 multiple part Delphi into children with unexplained language problems, led by Dorothy Bishop, did not suffer such a disappointing fate. Between them, two facilitators and 57 panellists maintained enthusiasm for the project, achieving 80% consensus around key goals. They also gained new perspectives on international and interdisciplinary viewpoints and concerns, while pinpointing areas of indecision, such as uncertainty among ASHA members over the wisdom and practicality of abandoning the term Specific Language Impairment (SLI) in favour of Developmental Language Disorder (DLD)...or not. The panel began with the people who were asked to write commentaries for an International Journal of Language & Communication Disorders special issue on The SLI Debate (Ebbels, 2014) and all co-authors of articles therein, except for the Delphi moderators, psychologists Dorothy Bishop and Maggie Snowling. Ebbels, 2014, and Bishop et al., 2016, highlight the reasons for, and pitfalls of division around terminology for language disorders, building towards the Bishop et al., 2017 proposal for standard definitions and nomenclature to be applied around the world. The experts were drawn from ten disciplines or agencies (including Audiology, Charities, Child Psychiatry, Education, Paediatrics, Psychiatry, and Psychology, with a predominance of SLP/SLT clinicians and/or researchers) from the six MRA signatory countries: Australia, Canada, Ireland, New Zealand, the UK and the US. Their goal in phase one, round one (Bishop, Snowling, Thompson, Greenhalgh, and The CATALISE Consortium, 2016) was to work towards agreed criteria for identifying children with language disorders who might benefit from specialist services. Accord was reached in round two, resulting in a consensus statement, a summary of relevant evidence, and a commentary on residual disagreements and gaps in the evidence base (Bishop, et al., 2016). The diagnosis “Language Disorder” be used to refer to a profile of difficulties, associated with poor prognosis, that cause functional impairment in everyday life. 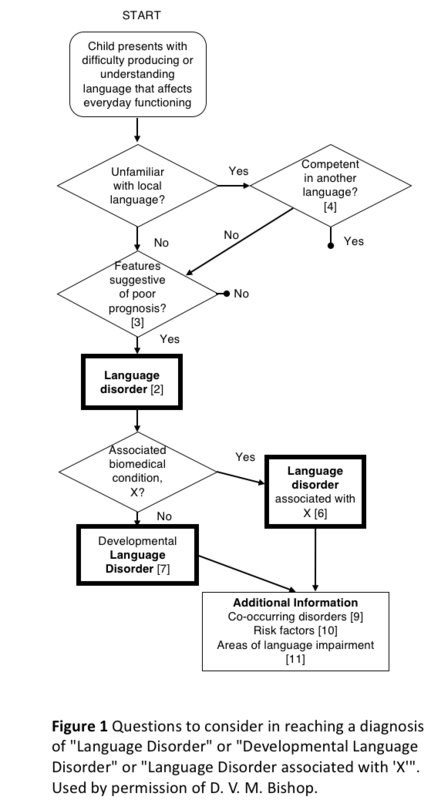 The diagnosis “Developmental Language Disorder” (DLD, with the social media hashtag #DevLangDis) be used when the language disorder was not associated with a known biomedical aetiology. Such aetiologies include, for example, autism spectrum disorder: ASD, language difficulties resulting from acquired brain injury: ABI, acquired epileptic aphasia in childhood, certain neurodegenerative conditions, genetic conditions such as Down syndrome, cerebral palsy, and oral language difficulties associated with sensorineural hearing loss. The diagnosis “Language Disorder associated with X” (with “X” representing one, or more, of the above conditions), be used when the language disorder was associated with a known biomedical aetiology, for instance, “Language Disorder associated with ABI” or “Language Disorder associated with Down syndrome and ASD” (see Bishop, 2017 for discussion). The (a) presence of neurobiological or environmental risk factors does not preclude a diagnosis of DLD. (b) DLD can co-occur with other neurodevelopmental disorders, and (c) DLD does not require a mismatch between verbal and nonverbal ability. risk factors might include, singly or in combination: family history, being male, living in poverty, having parents with low levels of education, and experiencing neglect or abuse. other neurodevelopmental disorders may involve, singly or in combination, difficulties with Attention (e.g., ADHD), Motor function (e.g., dyspraxia/developmental coordination disorder, dysarthria), Literacy (see Snow, 2016 for discussion), Speech, Executive function, Adaptive behaviour, Behaviour problems, Auditory processing, and Intellectual function. The term Speech, Language and Communication Needs (SLCN) be retained as a broad category that includes all children with speech, language or communication difficulties, for any reason. 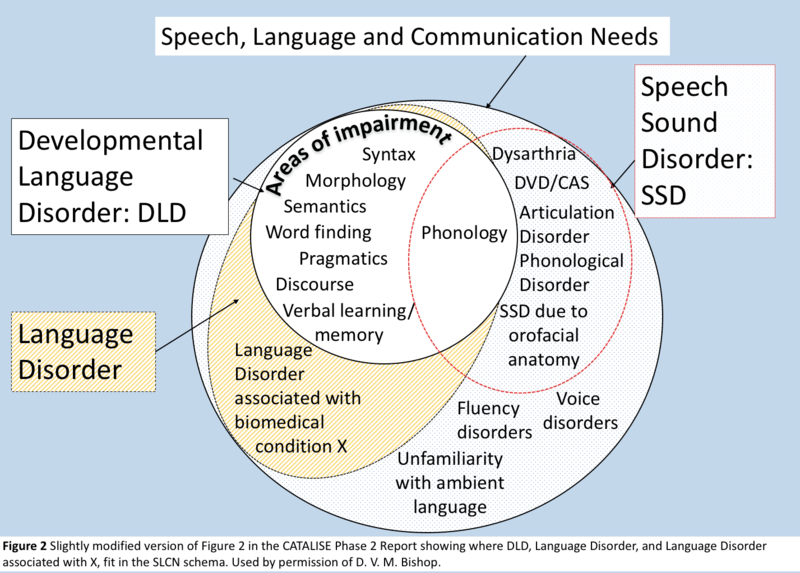 Figure 2 is a slightly modified (by the author) version of a Venn diagram in Figure 2 in the CATALISE Phase 2 Report, showing where DLD, Language Disorder, and Language Disorder associated with X, fit in the SLCN schema. The term SLCN is most strongly associated with Care, Education and Speech and Language Therapy practice in the UK (Dockrell, Howell, Leung, and Fugard, 2017), Ireland (IASLT, 2017), and the Metropolitan Region of the Department of Education and Training in Queensland, with occasional use in New Zealand. It came as a surprise, therefore, to find it prominently displayed in Speech Pathology Australia's useful Speech Pathology in Schools document, released in November 2017, and citing the 2016 pre-print of a short report of a Delphi conducted in the Netherlands (Visser-Bochane, Gerrits, E., Reijnevel, and Van der Schans, 2017). Is the small SLT/SLP world shrinking? A RCSLT revision of the Venn diagram includes “language difficulties in under-5s with few risk factors” in the white dotted area alongside fluency disorders, voice disorders, and lack of familiarity with the ambient language. This was a response to general concern among College members that these children, who take up many SLT hours, appeared to have been overlooked. Dockrell, et al. (2017 p. 2) explain that in England, the 2001 Special Educational Needs’ (SENs) Code of Practice included a category “Communication and Interaction”, subdivided into SLCN and Autism Spectrum Disorders (ASD). SLCN refers to children whose primary need is reflected in their oral language and excludes sensory impairment, cognition, ASD, or a specific learning difficulty. They note that educators and SLTs conceptualize the term differently from each other, with SLTs applying SLCN to a broader group of children (Dockrell, Lindsay, Roulstone, and Law, 2014), and that teachers greatly value profiling of a child’s difficulties, finding descriptions significantly more useful than a formal diagnosis. The 2001 categorization of SENs was retained in the 2015 revision of the code, which included a new requirement for health, education, and care personnel to work together to enhance joint outcomes (Department for Education, 2015). Two speech-language pathologists, Patchell and Hand (1993) produced, for a readership of teachers, an easy-to-understand language disorders' explainer for the Independent Education magazine. The piece contains a simple description of the terminological barriers to teacher-SLP/SLT collaborative partnerships, which persist. Chief of these was teachers' and SLPs'/SLTs' different conceptualisations of the word “language”. Apart from the advice to “evaluate learning styles” (Howard Gardner's multiple intelligences work was popular in Education at the time, but see Gardner, 2003) the authors' advice for modifying teacher talk, and classroom work, to assist students with language disorders, are probably as useful to teachers now as they were a quarter of a century ago. The advice included a call for high school teachers to “routinely talk with significant others; parents, special education teacher, speech pathologist, counsellor etc. when students [with language disorders] have problems” (p. 7). If teachers and SLPs/SLTs unwittingly talk at cross purposes, mixing terminology in confusing ways, when they engage with families and others, communication will break down. Parents, media, and the public have an understanding of labels like ADHD, Autism, Cerebral Palsy, Down syndrome, Dyslexia, and Hearing Impairment, but despite its high incidence most have not heard of SLI. As terms, Language Disorder, and Developmental Language Disorder are more readily understandable for families, funding bodies, and decision-makers than “Specific Language Impairment” ... provided they know what “language” means in this context. All the more reason, then, for SLPs/SLTs to embrace the new terminology and actively raise awareness of DLD in the world community, including in the news, current affairs and social media. The inaugural DLD Awareness Day, with the hashtag #DLD123, was on September 22, 2017. It was marked by functions at University College London, the University of Sydney, and other locations worldwide, and coincided with the publication of a special issue of the Journal of Child Psychology and Psychiatry (JCPP), edited by Courtenay Norbury, devoted to DLD, a new video from the freshly re-badged Raising Awareness of Developmental Language Disorder (RADLD) campaign (formerly the RALLI campaign), featuring the unstoppable Eddie and Dyls, and another by the equally unstoppable Dorothy Bishop. Thanks to Becky Clark and others, the RADLD Campaign has a fun, informative and interesting YouTube channel, and tweets via @RADLDcam. “... where prioritisation for clinical services is a necessity, we need to establish the benefits and cost-effectiveness of each contribution. Good evidence exists for SLTs delivering direct individualised intervention, and we should ensure that this is available to those children with pervasive and/or complex language impairments. In cases where service models are being provided which lack evidence, we strongly recommend that SLTs investigate the effectiveness of their approaches... Ineffective services are wasteful of limited resources and time (including the time of SLTs, parents, education staff, and the children themselves) and yet there is evidence that SLTs frequently fail to use evidence-based interventions, preferring to use their own local methods (Roulstone, Wren, Bakopoulou, Goodlad, and Lindsay, 2012). While clinical decisions may be a response to local need, resources, and priorities, SLTs should be clear how these differ from evidence-based interventions and collect data to establish whether they are effective in achieving their aims.” (p. 17). “Children with complex and pervasive language disorder and those with additional complex needs require the specialist skills of SLTs in order to make progress. SLTs need to have adequate time to work directly and collaboratively with these children, their families and educators, to improve their skills and reduce the functional impact of their language disorder.” (p. 18). Of the MRA associations, the Irish Association of Speech and Language Therapists (IASLT), the Royal College of Speech and Language Therapists (RCSLT), and Speech Pathology Australia (SPA) were quick to respond to the CATALISE recommendations, and ran with the new DLD terminology, preferring it to SLI. Speech-Language & Audiology Canada (SAC-OAC) and the New Zealand Speech-language Therapists' Association (NZSTA) were discussing possible “official positions” at the time of writing. The largest of the associations, the American Speech-Language-Hearing Association (ASHA) with its 191,500 members and affiliates, has not thrown its hat into the ring in an official sense, yet. There has been plenty of SLI vs. DLD discussion, however, among ASHA members, with billing codes and insurance pay-outs emerging as apparently intractable sticking points. Unsurprisingly, private health insurers decide who will and will not be insured, who will and will not receive reimbursement for services, and for which diagnoses (or insurance codes), even when they do not fully understand the diagnostic nuances of disorders for which there is no biological test, like blood, urine, or chromosome studies. Similarly, public healthcare financing is driven by people who may not “know about” children with Language Disorders. As discussed above, Educators and SLPs/SLTs conceptualised “language” differently from each other (Patchell and Hand, 1993), and there are significant differences in terminology-related practical considerations for speech-language professionals in different parts of the world. An example of the latter is the parting of the ways between “Developmental Verbal Dyspraxia” (DVD) the term used in the UK and recommended by the RCSLT, and “Childhood Apraxia of Speech” (CAS) the term used in the US and recommended by ASHA, because US insurance companies do not pay out for anything earmarked "developmental". “Childhood” is insurance-friendly; “Developmental” is not, even though “childhood” indicates that a disorder becomes apparent in childhood, and “developmental” indicates exactly the same thing. Australian, British, Canadian, Irish, and New Zealand motor-speech disorders' researchers can, and do, use “CAS” in their publications, and clinicians can use it in all facets of practice, partly because there are no potentially undesirable repercussions for clients if they do (and also because they wish to support the cause of consistent terminology across national boundaries), but the reverse is not true. You just don't find American clinicians, or academics using “DVD”, with only a smattering of them using “DLD” at this time. Fortunately, that does not mean that there are no signs of change. For example, it is heartening to see @ASHAjournals and @SIGperspectives Tweeting the hashtag #DevLangDis, and @s_redmondUofU, @mcgregor_karla, @Shar_SLP, @SlpSummer, @kimberlyslp, @hstorkel, @ecoleSLP, @lfinestack, @TELLlab, @9wyneth, @kush_stephanie, @staceypalant, and other ASHA members with #DevLangDis or #DLD123 in their Twitter bios. Clinicians in private practice in the States are between a rock and a hard place in deciding whether to stay with SLI or to transition to DLD as their preferred diagnostic term. They want to serve their clients responsibly, effectively and ethically, and as part of that process they will want to ensure that they tick all the boxes so that their clients (or their parents) receive unambiguous invoices and timely reimbursement. They may also believe that “terminology is important for more than insurance coding. It's also important for self-advocacy, arguing for increased research dollars, and for identifying reliable treatments/approaches to resolving the challenges posed by the disorder” (Sean Redmond, Language Section Editor-in-Chief, JSLHR, personal correspondence, Nov 7, 2017). Ethical practice and evidence-based practice are inseparable. If practitioners infer from the literature that lack of consensus about terminology leads to confusion and impedes both research and children's access to appropriate services (Bishop, 2014), and they simply like the CATALISE recommendations, then they might feel the urge to join the majority (of associations; not the majority of SLPs at this point) and apply DLD as a diagnosis. But if they do, the financial penalty for clients is instantaneous. In turn, their incomes are set to suffer as the word gets around that the SLP concerned does not apply “conducive”, insurance-friendly terminology. DLD, DVD, SLI and CAS are abbreviations for communication disorders that do not dissipate over time; they can be managed and ameliorated with appropriate intervention, but they persist for a lifetime. Most researchers and practitioners will agree that DLD cannot be “cured”, and language “normalised” through therapy. Rather, clinicians aim realistically, without setting their sights too low by underestimating what they and the child can do, to improve functioning, while acknowledging that the forecast is for long-term difficulties. The professional associations, ASHA, NZSTA, SAC-OAC, and others, embrace and endorse the new DLD terminology, as IASLT, RCSLT and SPA have done, encouraging their members to use it. Inclusive, open discussion between stakeholders, about intervention goals and expectations. Should the primary goal for children with DLD be to narrow, or even close, the gaps between their language performance and that of typical peers, or should we be focusing on achievable, functional outcomes? If yes, how should those outcomes be measured, and what should the (collaborative) professions be saying to families? The unhelpful delay vs. disorder dichotomy being shown the door. Political lobbying, at the local, national and international levels, for better provisioning for children, young people, and adults with DLD. Increased understanding of DLD and its implications, including general community awareness that early literacy difficulties and language disorder are highly correlated. Research, including high quality Randomised Controlled Trials where practicable, leading to clearer pictures of: what “effective” intervention looks like; the impact of DLD on children (Levickis, Sciberras, McKean, Conway, Pezic, Mensah, Bavin, Eadie, and Reilly 2017); the impact of DLD in adulthood; and when in development intervention will have most impact. Is there an age, stage or window in which children will progress “faster” in response to intervention? Is there a critical level of intervention: what dosage (frequency and intensity) of intervention is optimal? Research into intervention with children with DLD associated with comorbidities, and children with low IQs; and, more collaborative research partnerships between clinicians, educators, psychologists and researchers. Research studies of the cascading effects of language therapy on other areas of development and function; for example, does language intervention improve social, emotional and behavioural functioning (Levickis, et al., 2017)? Research literacy as a “given” attribute of all members of the profession, wherever and whenever they trained. Only SLPs/SLTs who are critical consumers of research are in a position to clearly understand intervention studies and to see their applicability to practice. This means that all training institutions must include research methodology, experimental design, statistics and logic in their curricula, in sufficient depth. Improved ease of access, for clinicians, to free or affordable high quality research. Time to read new literature timetabled-in to practitioners' workload, and not something that has to be done after-hours. SLPs/SLTs to be more politically astute, active, and aware of opportunities to impact public policy, and more actively supportive of those who are already trying. The CATALISE Delphi provides the perfect springboard for effective lobbying, which would see the profession, globally, and its agents applying a range of strategies designed to develop and/or realign policy around DLD, by influencing government (including regulators), consumers, and the public. Lutkehaus, N. C. (2008). 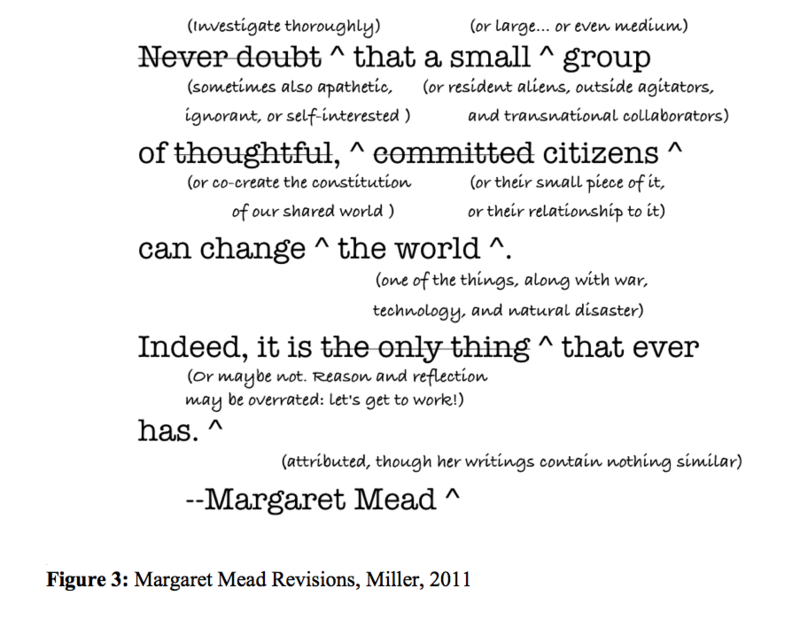 Margaret Mead: The Making of an American Icon, Princeton, NJ: Princeton University Press, p. 261. The IJLCD Winter lecture: Dorothy Bishop: Why is it so hard to agree on definitions and terminology for children's language disorders?